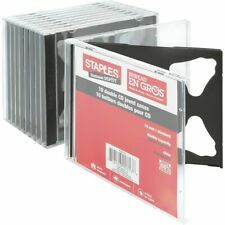 Staples Standard Jewel Cases for CD, Black Plastic (30026-CC). • Each case holds one CD. The jewel case is constructed from clear plastic with black dividers for added convenience and protection. Size: standard 10mm double cases. 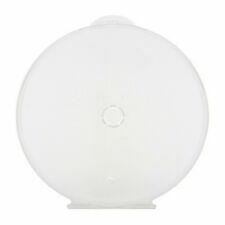 Material: clear, plastic top with black plastic divider inside. Weight: 80GR. Type: CD DVD White Envelopes. Quantity: 1000 pieces (10 x 100pk). Weight: 60 micron thickness. Quantity: 1000 pieces (10 x 100pk). Weight: 80GR. Type: CD DVD White Envelopes. Quantity: 500 sleeves (5 x 100pk). Type: CD DVD BLURAY Clear Plastic Sleeves with Sealable Flap. Heavy Weight: 40 micron thickness (1.6mil). Quantity: 100 pieces. Or graphics covering the front, the spine and the back. · Capacity: holds 1 CD / DVD disc. · The cases have a clear / transparent sleeve cover for labels. from the case. 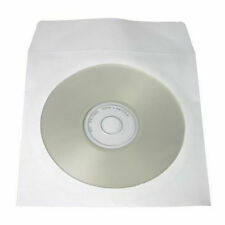 500 CD DVD BLURAY Premium Quality CPP Clear Plastic Sleeve with Flap Envelopes 100micron. Type: CD DVD BLURAY Clear Plastic Sleeves with Flap. Quantity: 500 pieces (5 x 100pk). Heavy Weight: 100 micron thickness. OPP Sealable Plastic wrap bag for 10.4mm CD Jewel Case. Type: OPP bag. Cd Jewel Case Resealable OPP bag. Quantity: 100 Opp bags. Capacity: One 10.4mm Standard CD Jewel case per sleeve. Type: CD DVD BLURAY Clear Plastic Sleeves with Flap. Capacity: 1 Disc per sleeve. Heavy Weight Plastic: 65 micron thickness. 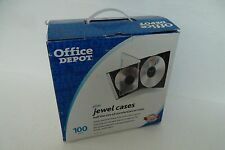 100-Pak =RESEALABLE= Plastic Wrap CD Sleeves for 10.4mm Jewel Cases! Resealable plastic wrap CD sleeves! Enclose a standard 10.4mm thick jewel case in these clear, opp sleeves - they replace the original shrinkwrap with a resealable sleeve. For easy insertion, the resealable strip is located on the body of the sleeve, not the flap. 200 CD DVD BLURAY Premium Quality CPP Clear Plastic Sleeves with Flap 100micron. Type: CD DVD BLURAY Clear Plastic Sleeves with Flap. Quantity: 200 pieces (2 x 100pk). Disc Not Included. Heavy Weight Plastic: 120 micron thickness. With Stitching on Borders for added Durability. Type: CD DVD BLURAY Clear Plastic Sleeves with Flap. Capacity: 1 Disc per sleeve. New Frosted Clear "Standard-Size" Quad DVD Cases with Swinging Tray! Each case has a full, clear unsealed sleeve or overlay to hold your graphic insert. The first disc is held on the inside cover (left). The Slimline CD Jewel Case is half thickness of a Standard CD Jewel Case. Room for a front panel insert. Great alternative to the traditional jewel case. Half thickness of regular jewel case size. Jewel Case. Black Slim CD Case. Singel CD or DVD. No Exceptions. Non Woven Material, does not scratch the disc. Each sleeve holds 2 discs. Quantity: 100 pieces. Slit on the paper makes it easy to open and close the paper sleeve. Paper sleeves has a clear plastic film that allows you to see the contents of the CD/DVD sleeve. Convenient, compact, and cheaper way of storing your CDs/DVDs over hard plastic CD/DVD cases. 200 CD DVD BLURAY Premium Quality Multi Color Paper Sleeves with Clear Window and Flap. Type: CD DVD BLURAY Multi Color Paper Sleeves with Clear Window and Flap. Color: Black, Red, Yellow, Green and Light Blue. OPP Sealable Plastic wrap bag for 14mm DVD Case. Type: OPP bag. DVD Case Resealable OPP bag. Quantity: 100 Opp bags. Capacity: One 14mm Standard DVD case per sleeve. Resealable flap. 200 CD DVD 80GR White Paper Sleeve with Window and Flap Envelopes. 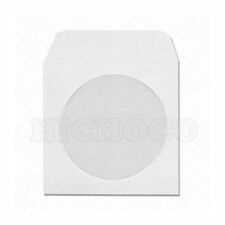 Type: CD DVD White Envelopes. CLEAR GREEN 14MM THICK CASE. Window covered by transparent film. 80 g Paper Material Premium Grade. No Exceptions. 100 pk each order. Jewel Cases for CD or DVD. They hold your front and back graphic inserts. The case has a removable clear tray that holds a cd or dvd. The clear tray is great for using double sided graphic inserts in the back. BLOW OUT. Storage (Red, Green, Blue, Yellow, Black). Paper Sleeve for CDs and CD/Recordable, CDRW, DVD and other Compact Discs. 191mm (H) x 135mm (W) x 14mm (D). Only new in the since the surface of the case has not been exposed to other surfaces than the inside of a wrapper. I open new, wrapped from the factory DVD sets, then remove the discs, wrapper, and artwork. Resealable Plastic Wrap OPP Blu-ray Sleeves slip over a standard (12mm thick) Blu-ray Case replacing the original shrinkwrap. Does not fit a Blu-ray Steelbook or a Blu-ray case slipcover. RESEALABLE PLASTIC WRAP BLU-RAY SLEEVES. Quality you can trust! Material: 80g Paper. Quantity: 100 pcs. Utilizes a push hub to hold discs. Has a clear outer plastic "full wrap" to hold artwork. Accommodates up to 4 discs. This DVD Box opens/closes like a book. Disc is not included. Case color is black. NO RESERVE . Slim DVD storage cases with patented centering hub. Total DVD Case Count of 25. 1/2 The Depth Of Standard DVD Cases. 50-Pak 1CD 10.4mm Single Jewel Cases. Single 10.4mm 1CD Jewel Cases (assembled, black tray). Each 10.4mm thick jewel case consists of two assembled parts: the outer, clear jewel box and the black or clear tray. Perfect for putting CD, DVD Disc etc. Provide storage & protection for your CD & DVD. 1 pcs X 100 CD sleeve. One CD sleeve can collect two Discs. Type: CD disc/sleeve. Detail Image. Total length:12.5x14cm /4.9"X5.5". Blow Out Sale Final Sale Blow Out Sale Final Sale . Each disc is held snugly with a stress-free, push-button hub. A raised lip cradles each DVD and protects against rubbing. 191mm (H) x 135mm (W) x 22mm (D). 1 case holds 6 discs. 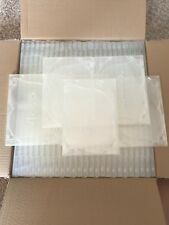 100 Pcs- Clear Resealable CD Cello / Poly Bag Sleeve. (Perfect for 10mm thick standard CD Jewel case 14.3 x 12.5 x 1 cm ). Crystal clear, resealable (self-adhesive strip on the body of the bag not on flap) ,open on long side. Evelots CD Storage Bag-Sturdy Handles-Hold 50 CDs Total- Blue Stripes, Set/2. 1 MULTI-3 CD JEWEL CASES W/BLACK TRAY, ASSEMBLED, TOP QUALITY, IDEAL FOR CDR/DVD-R DUPLICATION AND YOUR VALUABLE PERSONAL CD/DVD COLLECTION. LIU & DB ENTERPRISES, INC. SINCERELY. Maxtek CD Jewel Case made by high quality hard plastic material. How to use the CD Case: Simply place the DVD or CD on hub in the center of the tray. Holds one disc ( CD, DVD, Blu-Ray Discs). Shape: Square/Rectangular. Vera Bradley Pink Elephants CD/DvD Case - EUC!!! Instead of keeping family memories and business information in bulky 3-ring binders, you could pass down CDs and DVDs. In this case, business and personal photos, music, and documents stored on discs need protection from grazes and spills. Use paper sleeves for long-term storage or when distributing discs to customers or friends. 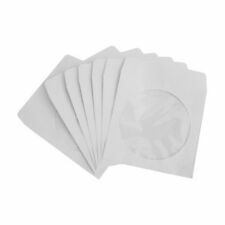 You can purchase CD and DVD paper sleeves in bulk in packs of 100, 500, and 1,000 sleeves. Furthermore, they fit standard-size CDs and DVDs, and many contain a scratch-reducing material to safeguard your valuable information. Shop on eBay for these low-cost storage solutions with organizational features. What Features Should You Consider When Shopping for CD and DVD Sleeves? Windows: A clear plastic window, normally a 4-inch circle, made from a plastic, such as Mylar or Tyvek, allows you to see the label without opening the protector. You'll be able to find a specific disc quickly whether the sleeves are stacked, upright on a shelf, or stored in a container. White and Multi-Color Sleeves: For convenience and to save time, color code your data by category using multicolor sleeves. Otherwise, use a marker to write on white paper sleeves or apply a removable label to make notations regarding the contents. Writing on the disc is not recommended unless you use a water-based marker. Closures: Tuck in ungummed flaps or use peel and stick, self-adhesive closures that press and close to seal out dust and debris. How Do CD and DVD Paper Sleeves Protect the Contents? Light Exposure: The sun's UV rays can penetrate discs, thereby causing a photochemical reaction that could damage or deteriorate the recording layer. Never leave a CD exposed to direct sunlight for long periods, such as on your car's dashboard. Return a disc to its paper CD sleeve immediately after use to safeguard the data. Moisture: Accidents happen, such as turning over a bottle of nail polish remover, cleaning products, and rubber cement. Paper sleeves keep solvents and other liquids from soaking into a CD, which could cause permanent damage. Wear and Tear: Economical packaging solutions like disc sleeves protect your data when moving and handling the CD or DVD. Tiny scratches occur normally, whereas deep, wide gouges on the label side can cause permanent damage. In this case, scratch-resistant sleeves made from polypropylene plastic may reduce scratching when removing and returning discs to their protectors. Some people use polypropylene protectors for archival storage because the material adjusts to a wide range of temperatures and resists chemicals.